Of the many chants and slogans that have defined the frustrations of the past months’ Occupy Wall Street protests, one recurring theme has focused on the idea that greedy corporations do whatever they can to avoid sharing the wealth. But a look at the numbers tells more of a nuanced story. The Chronicle of Philanthropy, a magazine that monitors the charitable giving industry, tracks donations from the largest corporations in the United States from the annual Fortune 500 list. The magazine’s 2011 Survey of Corporate Giving includes data on 2010 donations for 180 of those top companies. To get down to the best of the best, MainStreet looks first at the five most generous corporations – those that gave more than 5% of their 2009 profits to charity in 2010. We then round up the five biggest donors – those corporations that gave the absolute most money to philanthropic causes last year. Read on to see if your favorite brand made the cut. 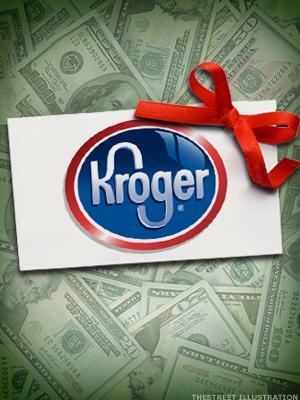 Kroger, the largest grocery store chain in America, was the only corporation to give more that 10% of its previous year’s profits to charity in 2010. While its charitable giving efforts target the communities in which its stores operate through volunteering and donations, the Kroger Foundation supports national initiatives that go far beyond the company’s home base of Cincinnati. At $64 million, the company’s significant giving in 2010 shows no signs of slowing down this year, as it has been an active participant in the Food 4 Less program to feed the hungry, and has also raised $1.5 million for military families and welcomed Salvation Army donation kettles into its stores this holiday season. Having long ago made a name for itself around the holidays by sponsoring New York’s Thankgiving Day Parade and making kids believe in Santa Claus again, Macy’s has also used the holiday shopping season to promote its various philanthropic efforts. Part of the retailer’s more than $41 million in 2010 giving went to a new initiative that took its stores’ national efforts to the local level. By funding more than 1,200 grants to organizations in the communities where the giant retailer operates, Macy’s made itself seem a bit smaller to the local population, and its overall efforts made it the second-most generous corporation of 2010. In addition to the many charitable promotions that Safeway administers at the checkout line in its 1,694 stores in the U.S., the company was one of the most generous corporations in 2010, with donations equivalent to 7.5% of 2009’s profits. The company provided funds, volunteers and in-kind donations to popular causes such as the Easter Seals, Special Olympics, Muscular Dystrophy Association, and prostate and breast cancer initiatives. Based in Michigan, Dow Chemical Corporation sells products and services to almost every country in the world, and the company uses some of the returns to invest in environmental sustainability and mutually beneficial relationships with the communities that it works in. This is just one example of how the company strives to live up to one of its common taglines – that it supports the “human element” in everything it does, through cash donations and the volunteer efforts of its many employees. Unfortunately, Dow’s giving tends to fluctuate widely depending on the company’s finances (2010 donations totaled 26.9% more than the previous year’s giving, which itself was more than 30% lower than in 2008), so next year might see a bit of belt tightening in the area of corporate philanthropy, as the company has seen a roughly 25% drop in its share price in the past year. Most people know New York-based Morgan Stanley as one of the largest investment banks in the world, but its philanthropic efforts set it apart from most of its peers. With a corporate giving philosophy that maintains that “generosity can certainly improve the communities in which we live and work, [and] it can also help us financially,” the company put its money where its mouth is in 2010, giving away 5.7% of the previous year’s almost $1 billion pre-tax profits. For clients with more modest budgets, Morgan Stanley also offers plenty of information on how to integrate charitable giving into individual investment plans. Topping the list for the overall biggest corporate donor in 2010 is Wal-Mart, which has claimed that distinction for three years running. With more than $300 million given to local and national initiatives to combat hunger and promote local economic development in the communities in which it operates, the retail giant has worked hard to overcome the image of an uncaring company that mistreats workers and puts mom-and-pop shops out of business. But a massive company should be capable of making massive contributions to the lives of struggling Americans, and the company’s philanthropy serves that purpose. This holiday season, Wal-Mart is promoting charitable donation through its “12 Days of Giving” campaign, just one example of its continuing commitment to lead the pack in giving for 2011. In 2010, Goldman Sachs was one of only two corporations to give more than $300 million to charitable causes – an incredible 353% jump from the previous year. After a few slow years, the company’s various philanthropic efforts ramped up significantly in 2010, catapulting the firm up to number two in the rankings. Wells Fargo isn’t in quite the same hot water as Bank of America, but after wrangling with customers over its own fees, the company has seen its stock fall 22% in the past year. That’s a shame, since the 8.5% increase in the company’s giving in 2010 – which went to programs that targeted important initiatives like homeownership and minority-owned small businesses – put the company’s level of giving at close to 2008 levels. The trend may be set to reverse though, considering the company’s struggles in 2011. Despite the terrible time Bank of America has had so far in 2011 (remember Bank Transfer Day? ), the company had a decent year in 2010 that allowed it to maintain roughly the same level of corporate giving that it did in 2009, at more than $200 million. While the bank would surely like to burnish its public image by making even more of an impact on the world of corporate philanthropy this year, it may be impossible considering the huge 66% drop in the company’s share price in the past year. With a variety of projects that operate in communities at home and abroad, Exxon Mobil’s philanthropic efforts jumped more than 6% in 2010 after a slight decline in 2009. Through its charitable foundation, the company supports projects in the U.S. that focus on creating economic opportunities for women and promoting math and science education in American schools. The group also administers the company’s main international project, the Exxon Mobil Malaria Initiative, to address the illness in partnership with nonprofit organizations around the world.